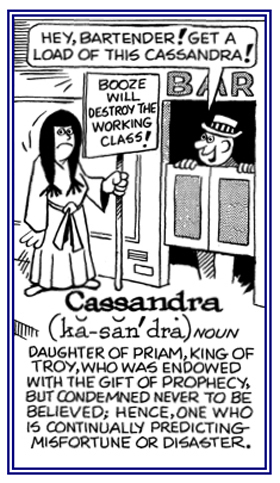 Someone who makes terrible predictions; especially those that are not believed by others, but which often turn out to be true: Anyone with the talent of Cassandra makes prophecies which are usually unheeded by other people even though the prognoses are valid. © ALL rights are reserved. 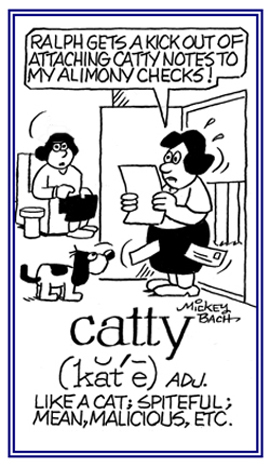 A description of someone who enjoys saying cruel or unpleasant things about other people: Janet's mother made a catty remark about the dress her daughter was going to wear to school. © ALL rights are reserved. 1. A meeting of members of a political party for the purpose of choosing candidates for an election: A presidential caucus was recently held in Iowa. Caucuses are planned in several states to nominate candidates for President of the United States. 2. Meetings of people; such as, members of the U.S. Congress, who meet to determine issues or to work together for certain objectives: The Congressional Education Caucus got together to see what can be done to improve the school systems in several areas of the country. To meet together to choose candidates or to discuss special issues and to work together for political goals: Both political parties will be meeting in various states to caucus for their candidates. 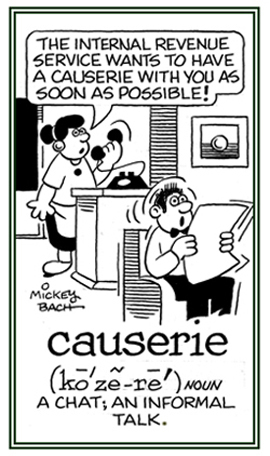 An informal conversation or discussion regarding a significant subject: Joe's parents wanted to have a causerie with him about the grades he received in his report card from school. © ALL rights are reserved. 1. An explanation or warning that should be remembered when anyone is doing or thinking about doing something: Manfred's investment advice came with a caveat that the stock market is impossible to forecast with complete accuracy. 2. A formal notice filed with a court or law officer to suspend a prosecution until after the person who is filing is given a hearing: Susan’s lawyer submitted a caveat asking for a break in the trial giving her a chance to testify and to give evidence as to what really happened before the legal proceedings continue. © ALL rights are reserved. The principle rule that a buyer cannot assume that his or her purchase will be exactly as hoped for or promised. 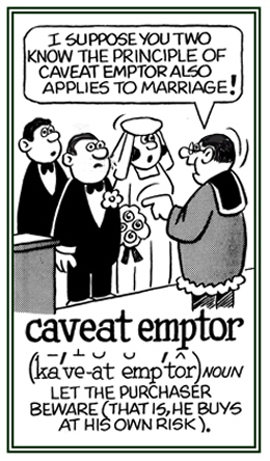 The full version is: Caveat emptor, quia ignorare non debuit quod jus alienum emit. "Let a purchaser beware, for he ought not to be ignorant of the nature of the property which he is buying from another party." The well-known shorter version, Caveat Emptor applies to the purchase of land and goods, with certain restrictions, both as to the title and quality of the thing sold. Out of the legal sphere and as a non-legalistic usage, the phrase is used as a warning to a buyer regarding any articles of doubtful quality offered for sale. This legal terminology means, the purchaser or buyer, not the seller, is responsible for protecting the himself or herself in the transaction. 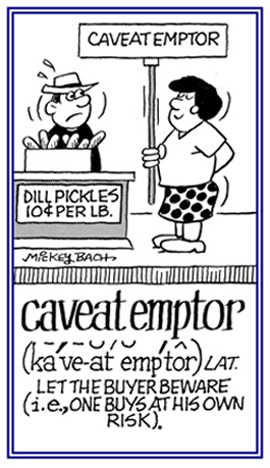 Caveat emptor is the opposite of "caveat venditor" in that, according to Eugene Ehrlich: Whereas caveat emptor has a long history in common law, "caveat venditor" is just now coming into prominence as a result of the consumer-rights movement. 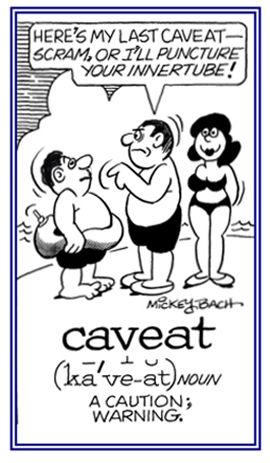 Under "caveat venditor", the seller is assumed to be more sophisticated than the purchaser and so he or she must bear responsibility for protecting the unwary purchaser. The purchaser, emptor, is a child who must be protected against his or her own mistakes, while the seller, "venditor", is the big, bad wolf lying in wait for Little Red Riding Hood. 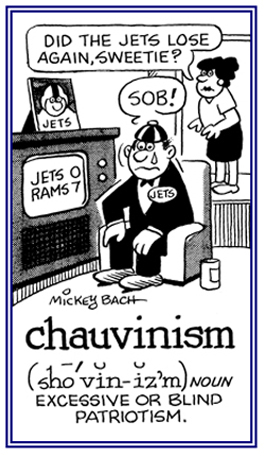 So while the two rules struggle for preeminence, attorneys gleefully watch—and litigate. —Eugene Ehrlich in his Amo, Amas, Amat and More, How to Use Latin to Your Own Advantage and to the Astonishment of Others, Harper & Row, Publishers, Inc.; New York; 1985; pages 77-78. 1. To move freely and without inhibition or restrictions: The little children were cavorting in the newly fallen snow by jumping into the soft piles, throwing handfuls at each other, etc. 2. To leap or to jump playfully; to romp, to frolic: Monte watched the ponies cavorting in the corral. 3. To spend time in an enjoyable and often wild or improper way: The politician was criticized for cavorting with the rich and ignoring the other citizens of his district. 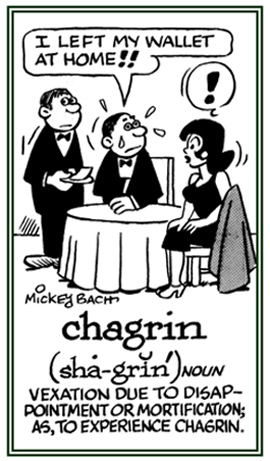 A mental distress caused by a failure to do something: The fact that she was unable to attend the concert was a source of chagrin for Mildred. When Mark and Jane were unable to get a room at the hotel while they were on vacation, it was a frustrating chagrin for them. 1. A vehicle carrying many passengers and which is used for public transportation: A charabanc is a large bus that is typically used for sightseeing. 2. A kind of long vehicle with transverse seats (crossing from side to side) generally facing forward: People lined up to get on the charabanc to go sightseeing. 3. Etymology: from French for a "wagon with seats" or a vehicle carrying many passengers and which is used for public transportation. 1. 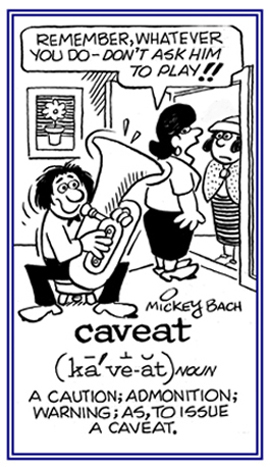 Cautious; wary; watchful; sparing in giving or expending affection, compliments, etc. : Blaine was chary about sharing his feelings regarding the progress of the project. Helena's chariest attitude is not to spend any more money for her university degree. 2. 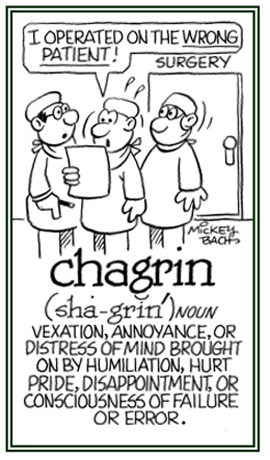 Etymology: from Old English cearig, "sorrowful"; and then from Middle English chari, "careful, sorrowful". 1. Excessive patriotism or eagerness for national superiority; extreme nationalism: The senator's chauvinism make him intolerant of the needs of other countries. 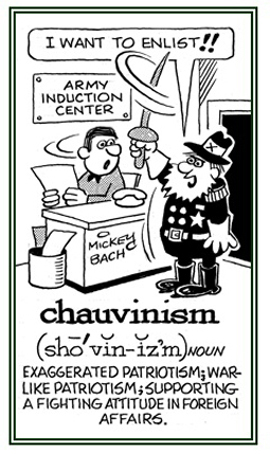 Interestingly enough, the term chauvinism was first used by a Napoleonic soldier, Nicholas Chauvin, who turned out to be an extreme patriot during that time. 2. 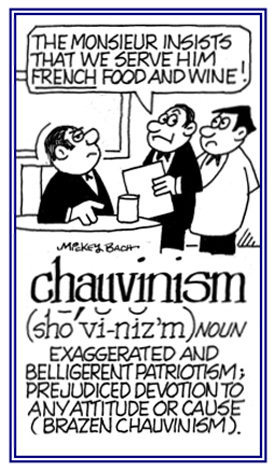 Unwarranted bias, favoritism, or devotion to one's own particular group, cause, or idea: Feminists say that male chauvinism is still prevalent in many cultures around the world © ALL rights are reserved. 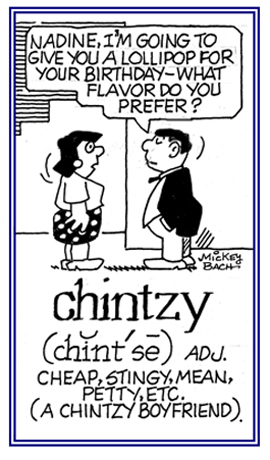 Descriptive of someone who, or an organization which, is not willing to spend money or to give anything of value away; stingy or cheap: Harry works for a chintzy company that rarely increases the wages of its employees. © ALL rights are reserved. The movie business is booming in China, and I wanted an inside look. Last year’s box-office earnings topped $1.5 billion, a 64 percent increase from 2009, making China’s movie market on target to be the world’s second-largest by 2015. Sometimes dubbed Chollywood, China's movie industry pumped out 526 films in 2010 (versus 754 in the U.S.), and the government has announced plans to more than double the size of the entertainment industries, including movies and television, over the next five years. Hollywood has noticed. Chinese-U.S. co-productions are on the rise, and Christian Bale, Kevin Spacey, and Keanu Reeves are among the stars who have sought projects here. So eager are American studios to crack the Chinese market that MGM recently edited Chinese villains out of the remake of Red Dawn, replacing them with North Koreans. Studios can’t afford to offend the officials who decide which 20-odd foreign films are allowed to play each year on Chinese screens, whose number grows by four a day. 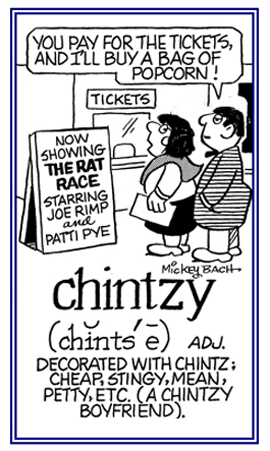 "Chollywood, Behind the scenes of China’s booming film industry"
by Mitch Moxley; ATLANTIC MAGAZINE, Cinema, September, 2011. 1. A device or a vessel in which milk or cream is mixed or shaken in order to produce an eatable kind of food: A churn is used to vigorously agitate cream until the butterfat is separated from buttermilk and it turns into fresh butter. Showing page 3 out of 7 pages of 95 main-word entries or main-word-entry groups.